Something exceptional happened, worth to mention. 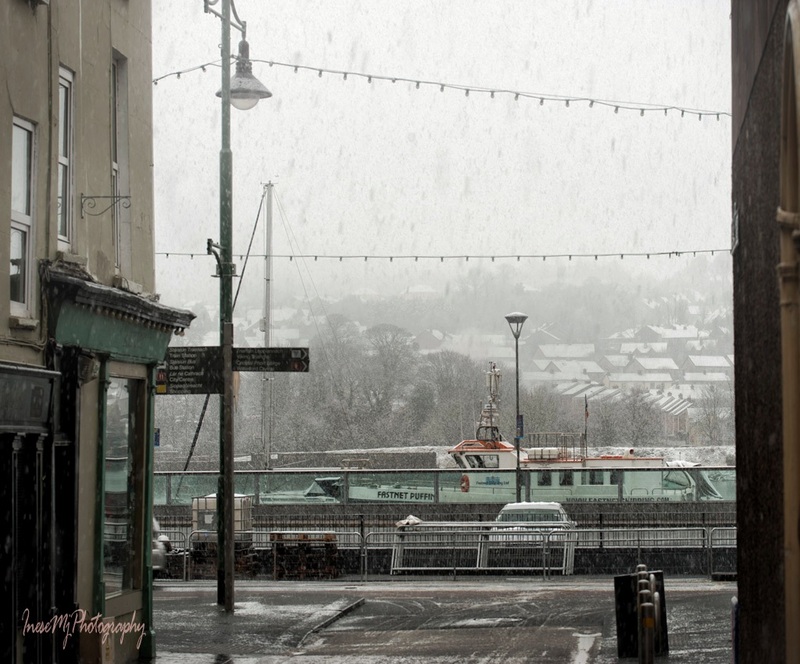 We have got a snowfall in Waterford. It didn’t last long though. When I finally got downstairs and limped out in the street, there was almost nothing to see. I had to use a slow shutter speed to make the falling snow visible in the pictures. 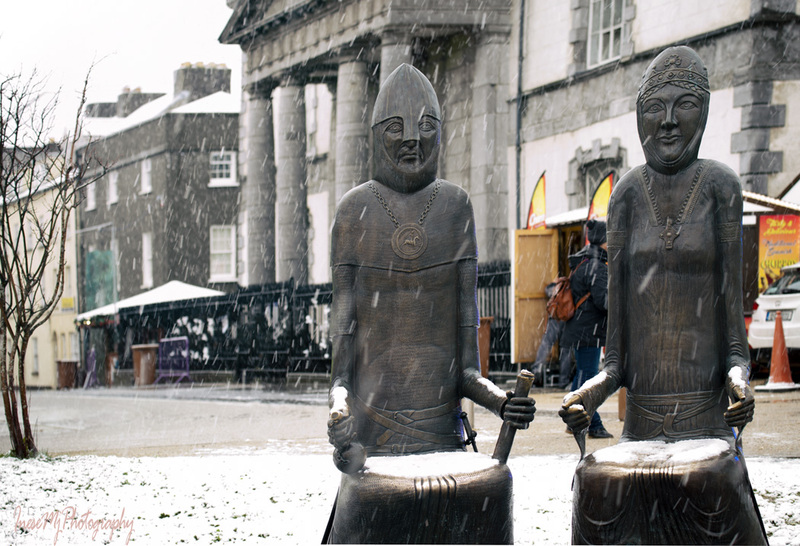 Aoife and Strongbow endured the snowfall well, despite their old age. Their marriage took place in August 1170, the day after the capture of Waterford by the Norman forces sent by Henry II and led by Strongbow who at that time was called Richard fitz Gilbert de Clare. But the Vikings came here first. They arrived in the 9th century and created a town in 914. The history of their reign is very complicated and violent, but so where the times. As we are speaking about the Vikings – here is a link to the blog run by hamsters of amazing author who wrote one of my favorite books – The Viking and the Courtesan. Shehanne Moore, thank you for your fantastic books! Please visit Shehanne’s blog! 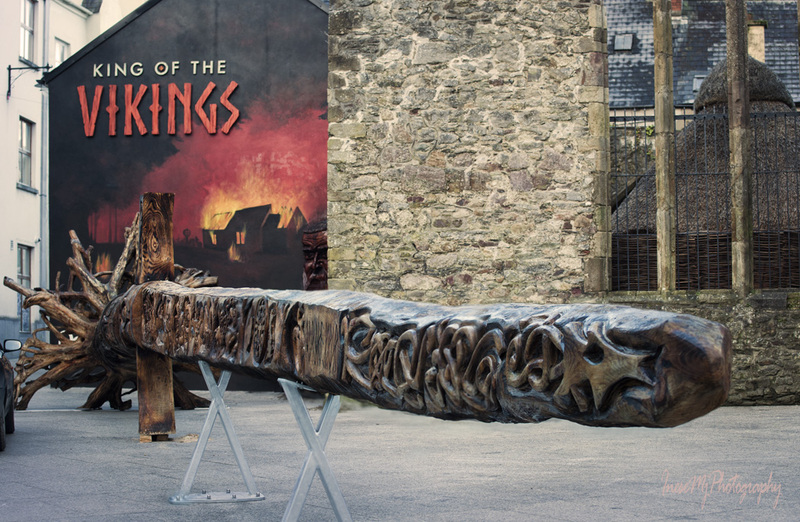 A local artist John Hayes envisaged a giant Viking sword carved out of a whole tree. John Hayes is a well known carver, and I have already posted photographs of some of his other work: Greenway train and The Angel of Fenor. You can read about the Viking Sword and here is a video I found on YouTube. 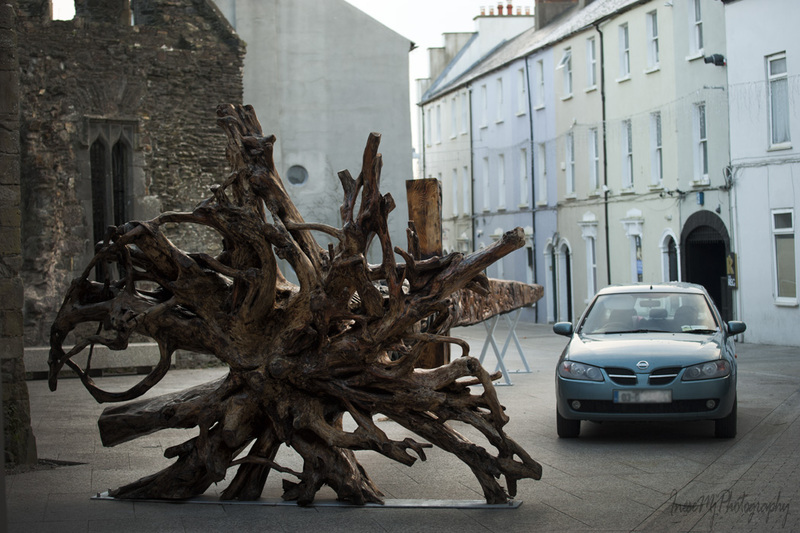 You can come to Waterford to marvel at the carvings as the work is completed and the sword has been placed on Bailey’s New Street, in so-called Viking Triangle. The street starts from the Reginald Tower where you can find the source of inspiration – a Viking sword made in the 9th century in Norway. Hopefully, John’s sword will be recognised as a world record. 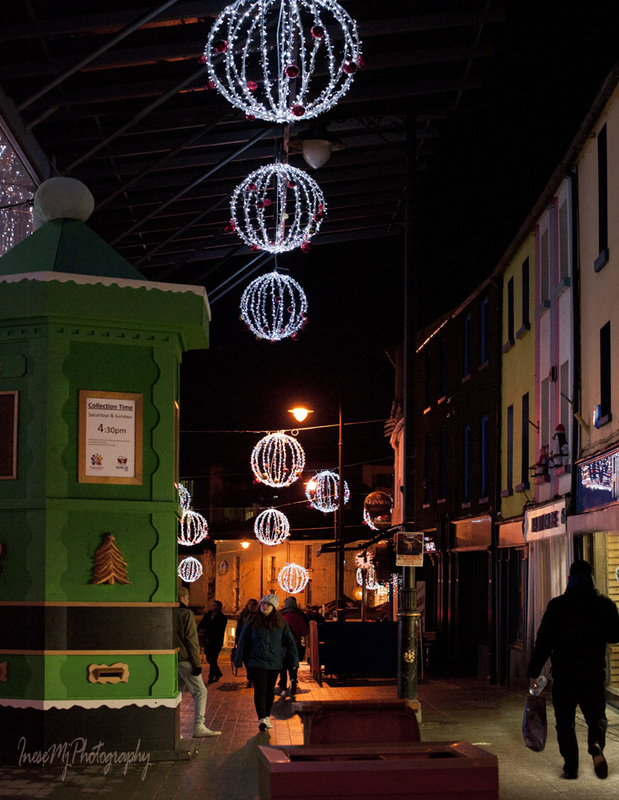 By the way, John Hayes also built this giant post box for the letters to be delivered to Santa. The box stands under the mirror roof of the Apple Market. I am not sure what I think about this roof, but I do love the reflections in the mirrors. The days are very short in December. In early hours of the morning when the lucky people were supposed to watch the Geminids, I was driving through the slashing rain to pick up my prescription. As much of an optimist as I am, I took my camera with me. To my surprise, outside the city the sky was clear and the thin waning crescent Moon was so pretty with Jupiter below and Mars on the right. 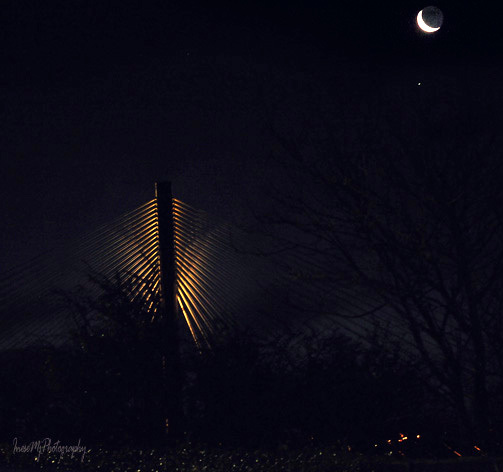 I had to crop Mars out because it was quite far and didn’t add to the picture, but I included the Waterford bridge. It was at about 6.30 in the morning. I saw two shooting stars while driving, but nothing major, no balls of fire or anything like that. I wish I had more time so that I could stand there until the dawn. This picture was taken 12 hours later. Last night I ventured out again to see if I can get some more pictures for this blog. There was a charity event in the Holy Trinity church and the gates were open. 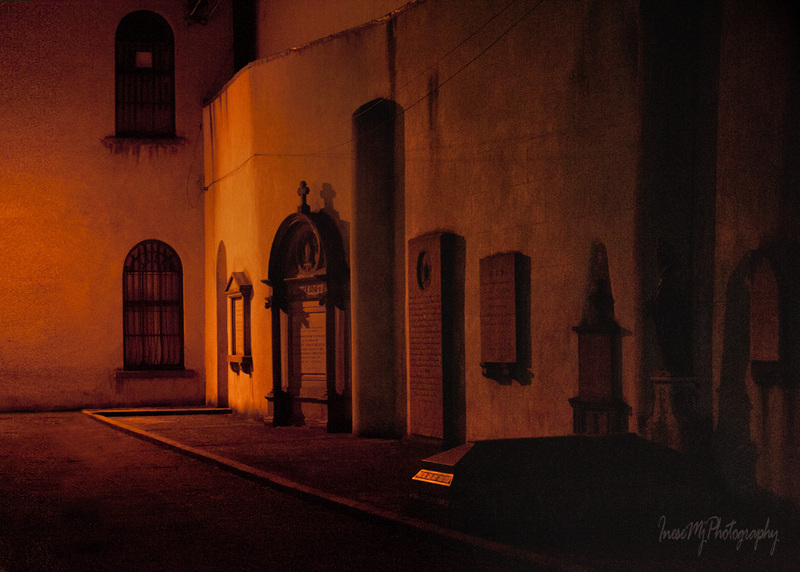 I used the opportunity and took pictures of churchyard and tombs. The horse ride must be fun. 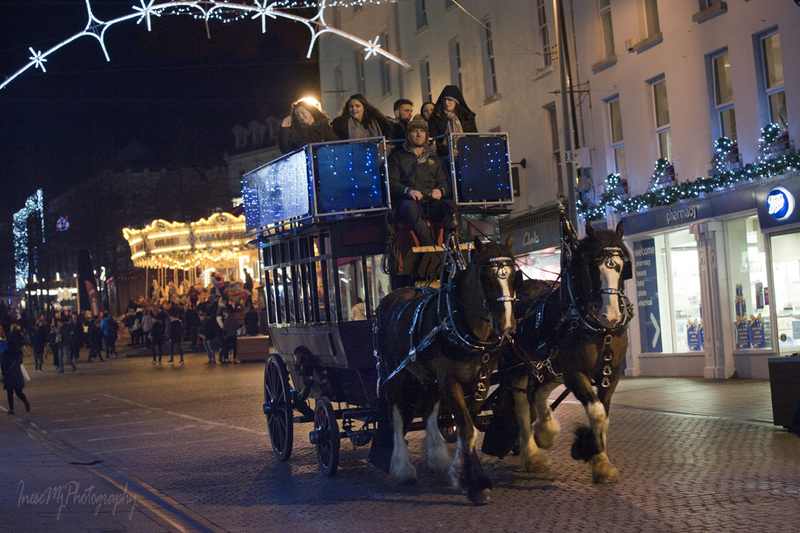 Except, I think the carriage full of people is too heavy for two horses. I remember there were four horses in the previous years. 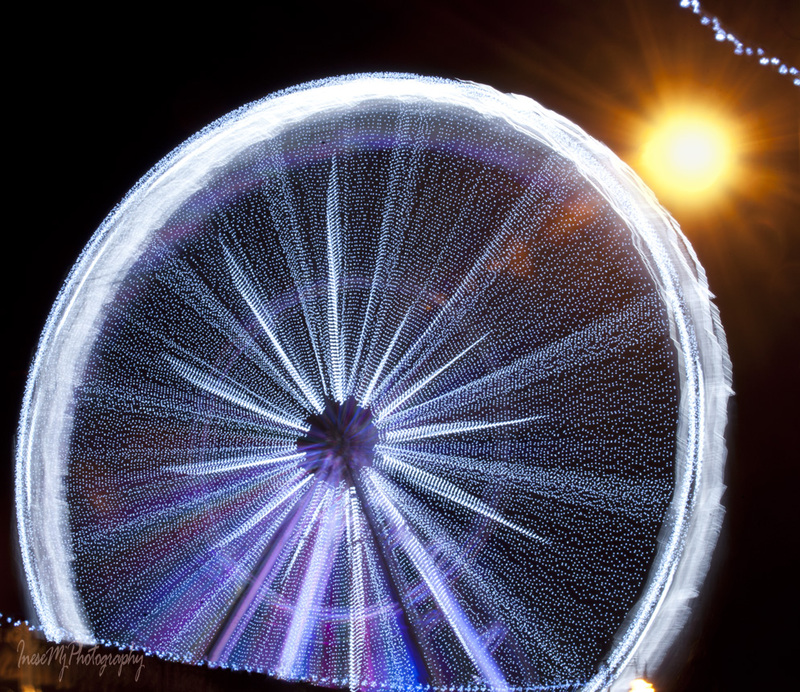 I set up my camera to take pictures of the Waterford Eye. I am not sure if I should take a ride. I might, but may be another day 😉 I am playing with the shutter speed – don’t want to get just a monochrome blurred disc. 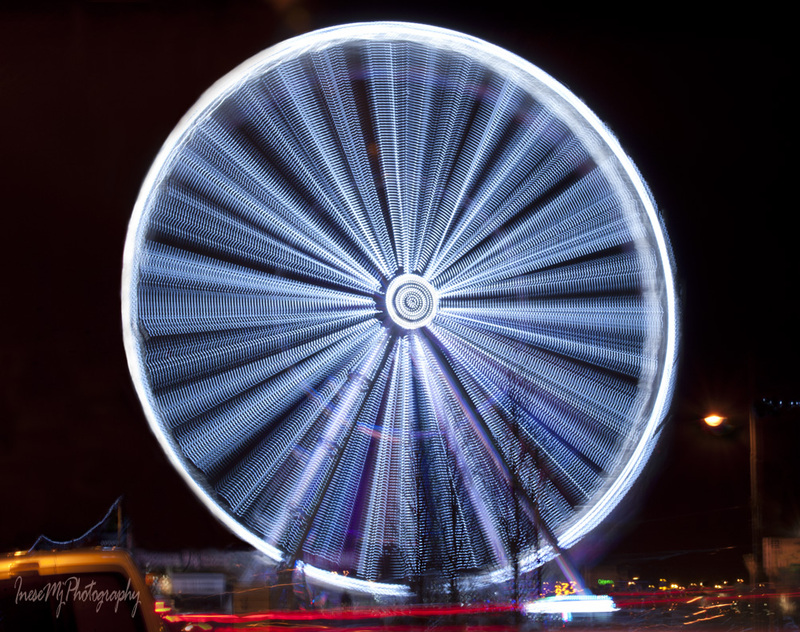 This picture was taken at 10 seconds, as the wheel is quite slow. The light show gives me the opportunity to get very different patterns which is really fun. The passing cars leave a red line in the picture. But what about Christmas? I didn’t see a single item that could be attributed to Christmas… until I looked down… wait, what is it there, under the porch, way lower than the pavement? A Nativity set! Tiny figures hidden from the people’s eyes, with the background made of garbage bags. Merry and bright it was. Sort of. So far, okay! My brother Randy is improving since his brain surgery after his Thanksgiving fall. . . So happy to hear that Randy is improving. Yay for modern medicine. Beautiful scenery and gorgeous photography, Inese! Fabulous photos, Inese, especially of the (moving!) 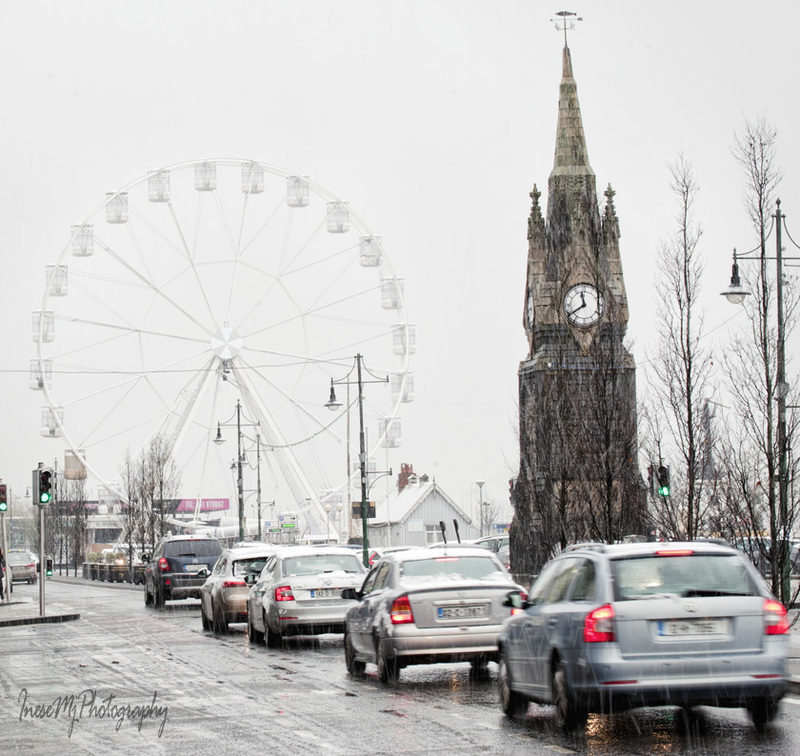 Waterford Eye – and the snowfall! Of course, I love the Viking sword. What an achievement that was, and it’s very beautiful. 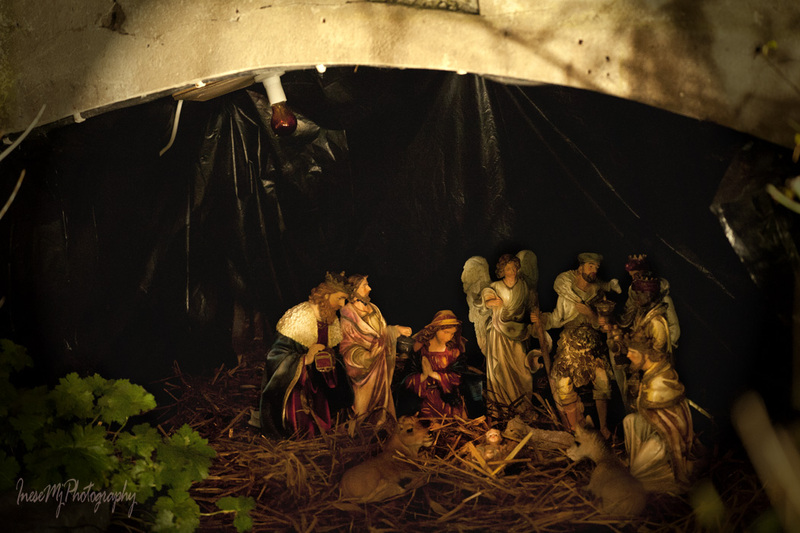 Lovely nighttime photos and a delightful Christmassy post. Thank you so much, Millie! 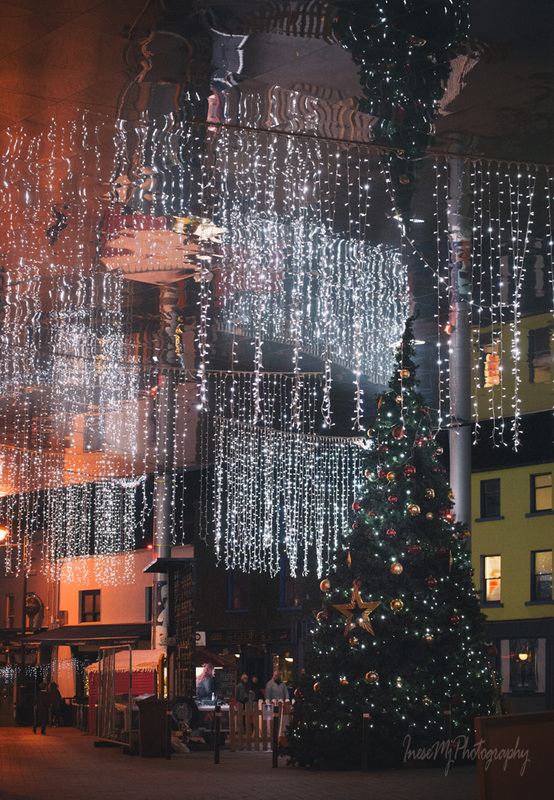 I always write about the Winterval festival, but this time I was under the ‘house arrest’ after my operation and didn’t get to see any fun. I’ve missed so much this year, Inese, and didn’t realise you’d had an operation. The health issues you mentioned are beginning to make sense now. Oh I had more than one, but I am a tough girl. Hope for the better. Beautiful pictures! We have very cold weather and very much snow, as well. Inese this is another wonderful post. What a marvelous combination of past, present, and whimsy. Wishing you well. Yuletide blessings and a perfect 2018. Hugs. Thank you so much, Teagan! Hugs. Is there still snow in Waterford? This is a very very holiday looking post. Your pics are lots of fun. I do like the blog run by hamsters, so think I’ll head there next. Maybe the little critters will let me say hello to Shehanne! Interesting history, and I love the pictures. I always love the first snowfall then I want it to go away. Irish history is very interesting and conflicting. The one thing though is that those who come and stay tend to become Irish. It has something to do with becoming one with the land in which one lives. I wish it were true for all those who settle in a foreign land. Until people become ‘local’, they behave like tourists. I agree – two horses for all those people is not fair! Love those pics of the Ferris Wheel. Wonderful! Happy Holidays to you and yours! I have overheard people talking that one of the horses was shaking and nearly collapsed after the ride 😦 Didn't see myself though, but it is too much of load for them two, obviously. How on earth did I miss this gem of a post? I only wondered if you’d posted over the weekend. WP has been playing up when it comes to some of the blogs I follow – they are not (even my own posts) appearing in the Reader. Regardless, I got here in the end. 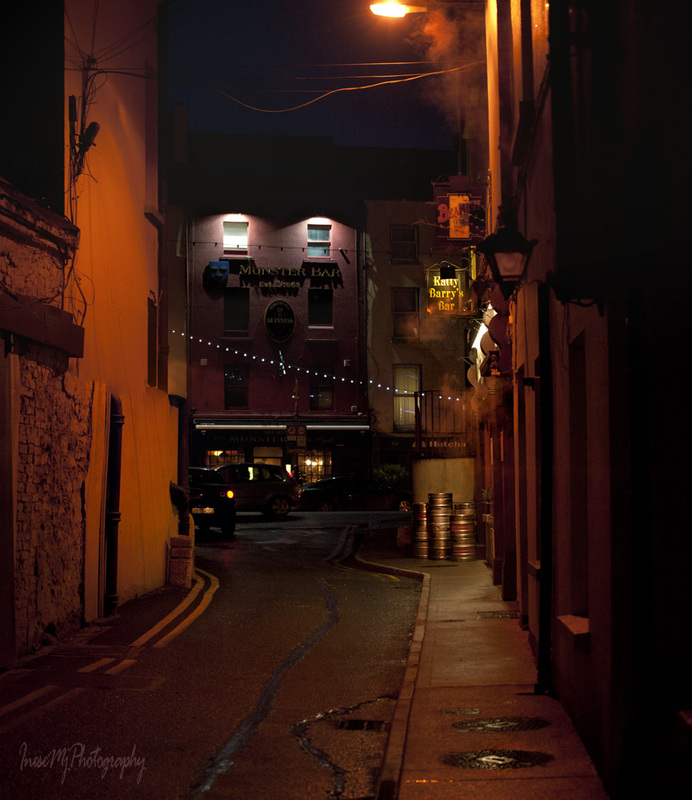 I’ve been to Waterford once in a rainy summer. Its nice to be reminded of it. Have a super Christmas, Inese. Thank you so much, Mike! I hope you guys will make it to Ireland some day. In my heart I know we must go back. I was told by a relative the other day my maternal grandmother was Irish…a thing my own mother always denied (for reasons never explained). I await the proof, Yet as a Remainer (in terms of the EU), if it is true I’ll kiss her gravestone and drink to her wellbeing, wherever she might now be, in a bar in Waterford and also toast the Irish legends. I wouldn’t be surprised, there is a high possibility you have Irish ancestors. If confirmed – I should know in a day or two – I shall be rather proud. I know on my fathers side we have a gypsy gal as my great, great…many greats grandmother (Eliza Mean) and I am also proud of her. My mother was of a different world, one full of phobias and complex illogical reasons in answer to questions no one ever asked in the first place. I am a tad annoyed that she never divulged much about my grandmother. I have but a single photograph of her…a very beautiful lady. I wonder what part of Ireland she is from. I too didn’t understand my mother, and it is one of the saddening things to me. I’ll let you know as soon as I hear back. I’ve supported the Irish rugby team over the English for years, so you know where I’m coming from. Merry Christmas to you, Inese! Dazzling photos of the wheels, and the dark side of me also loved the shadowy ones of the tombs. 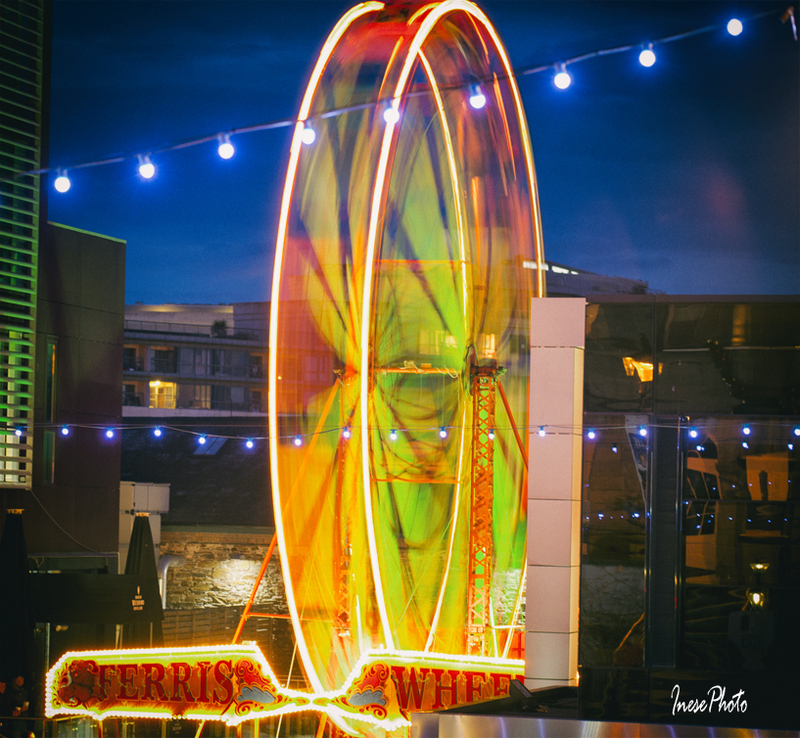 Did you get to ride on the little Ferris wheel? Thank you so much, Rose! I thought some people would love to see an evidence of the shortness of a winter day, enhanced by mysterious darkness of the old graves. I didn’t get a ride yet. I am growing the courage to ride the big one. Your photos are gems — dark or light, they are so beautifully captured! 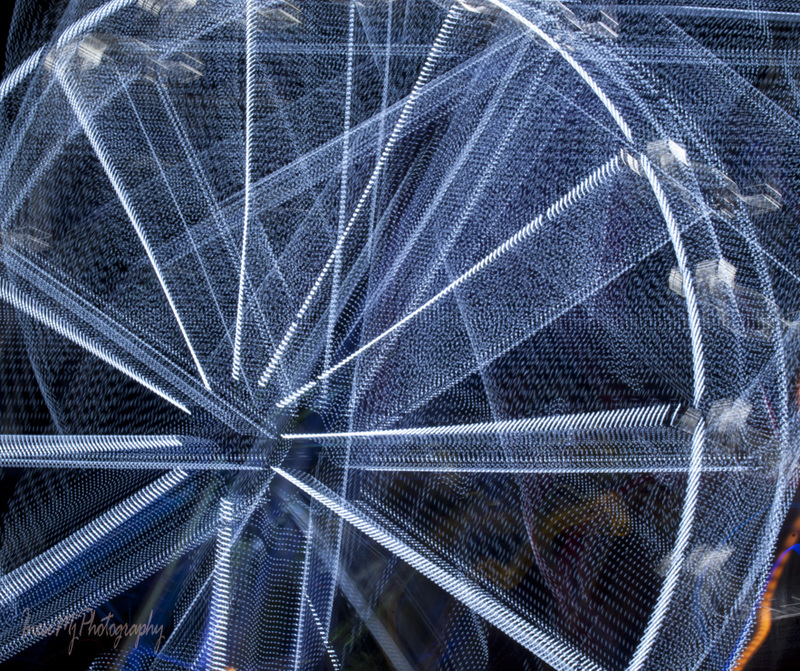 Inese – I love the pix of the ferris wheels – there are some great motion effects there. Great post! Thank you so much, Diana! The Vikings ruled over Waterford for about 250 years, including a hundred years after the official end of the Viking Age 🙂 Ireland has always been multicultural. Thank you so much, Julian! Great to hear from you, hope all is well. The snow was gone in an hour or so. I was not in condition to go to the mountains and make a snowman, but I would love to. Just a few miles north the snow had stayed a couple of days. 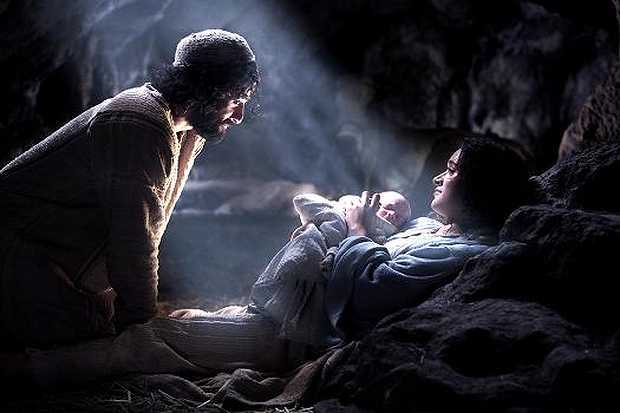 Wishing you a wonderful Christmas! I was just reading a National Geographic article about genetic mapping of the Vikings in Ireland, so your intro was timely. Nice night photography, that’s a style I’d like to explore more. Thank you so much! Yes, Waterford has strong Viking connections. They settled there and started trading instead of raiding. The Ímair dynasty ruled over Waterford for years. Ferris Wheel is a slow moving construction, not like a carousel, and to get a decent picture you have to use a really slow shutter speed. If I wanted a fully blurred image, I would use the BULB setting, as I did for the small Vintage Wheel, but for the big one I wanted to catch some pattern created by the light show, so I used 5-10” speed. Wonderfully atmospheric winter pictures Inese. Thank you so much, Andrea. The days are short, and all the fun things are happening in the dark 🙂 But the Solstice is finally here. 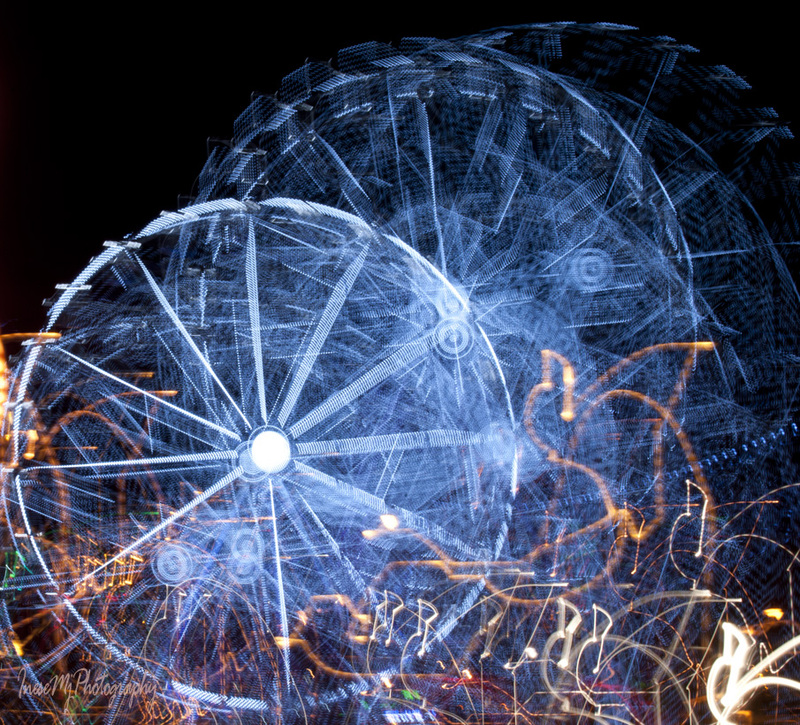 I love the Ferris Wheel images. So creative. Oh that is so very cool 🙂 They have amazing pieces of glass on display. Oh you had little white noise there ❤ We have had snow many times, but it has melted the next day. Now we have a really thin layer of snow, and let`s hope it will stay through Christmas but I guess there is some rain coming so I think we will lose our snow again too. Love what you did with the Ferris wheel pics! We’ve had no snow at all here. I waited all last week for the snow to arrive. It didn’t. Great photos. That is exceptional low-light, low-shutter-speed photography. You have this exceptional gift of invoking historical moments complete with the protagonists, it lends a timeless aura to your posts. You did great with capturing the snow and then coming up with a very creative blog as you took us along to unexpected places. History and political correctness! This afternoon we saw a local production of “A Christmas Carol.” To me the message for the season is to love one another. So does this count as your one day of snow? Great photos! Thanks for sharing! you indeed creative, have exceptional method to share a wonderful vision…This is a beautiful post with great title!! Oh me God, wait, I will edit the post. How could I …!